Customers may pay via cash, check, debit or credit card. We take Visa, Mastercard, Discover and American Express. In order to be valid, cards must be signed by the card owner. Clients are required to keep a credit card on file for those that wish not to pay at the time of service. Effective communication and understanding of practice fees and financial policy are vital elements in establishing and maintaining a rewarding professional relationship between client and veterinarian. Most of our fees are predictable, and can be quoted prior to seeing your horse. Others such as those requiring emergency or extensive diagnostic procedures can only be estimated. All clients are sincerely encouraged to discuss the costs of necessary procedures with us prior to their administration to avoid any misunderstandings. Fees are payable at the time of veterinary service for clients without preauthorized credit. We accept payments in cash or by check, Visa, MasterCard, Discover or American express. Invoices are mailed or emailed when payments are made via credit cards. We ask new clients to complete and return our Credit Card Authorization Form. A copy of your bill and credit card receipt will be mailed or emailed to you depending on your wishes. Our computer billing cycle closes on the last day of each month when statements that summarize outstanding invoices and the total balance due on account are mailed. Finance charges are only applied to past due balances (more than 30 days from date of service) at a rate of 1.5% per month. The minimum rebilling charge is $3.00. Accounts with any portion of an outstanding balance over 30 days from date of service are considered past due. Past due balances (more than 30 days from date of service) are automatically billed to your credit card at the end of each monthly billing cycle. We do not bill beyond 30 days. A fee of $25.00 is charged for each check returned for non-payment. 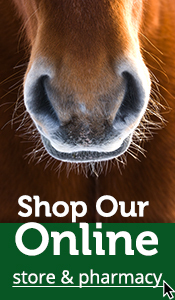 If your horse is insured, please plan on paying for our veterinary services directly. We do not bill insurance companies - only patient owners. We strive to complete insurance paperwork once received in a timely manner. Insurance arrangements do not affect when payment for veterinary services is due. If you plan to enter into a lease arrangement with another party, please let us know before the lease period begins. We are only able to change billing parties once both parties involved in the lease have contacted our office to authorize us to make adjustments (this process can be accomplished by phone). We are not able to make retroactive billing changes.